An often-overlooked Easter Egg in Google Chrome is the dinosaur game, which appears when you try to visit a website while disconnected from the Internet. The Chrome dino game is a simple infinite runner, which sees you jump over cacti, and dodge underneath obstacles. Controls are basic. Press space to jump (and to start the game), and the down arrow to duck. The goal is to survive for as long as humanly (or dinosaurly) possible — or at least until your Internet starts working again. To celebrate the fourth birthday of the Chrome dino, Google has published an interview with the developers who built the game, explaining its origins. So, why the dinosaur theme? According to Chrome designer Sebastien Gabriel, it’s a play on going back to the “prehistoric ages,” before the existence of ubiquitous Wi-Fi. While this will undoubtedly be alien to some of our younger readers, others will remember only really being able to get online in certain places: home, school, work, and specialist Internet cafés. Initial designs of the dinosaur character were given the codename “Project Bolan,” which itself is a reference to Marc Bolan, the late lead singer of 1970’s glam rock band T-Rex. Alan Bettes, Senior Visual Designer at Google, explained that the only restriction the team placed upon themselves was to keep the motion rigid. At the beginning we thought, “What if it did a cute little kick in the beginning like our favorite 90’s hedgehog? What if it roared to signal to people that it was alive?” But in the end, we settled on the basics of any good runner game: run, duck and jump. The game was released in September 2014, but initially struggled to perform on certain platforms — particularly on older Android devices. This necessitated a rewrite, which was completed by December of that year. The Chrome Dino game boasts impressive numbers — especially for something that is largely hidden from view, and you’re only likely to encounter if your Internet goes down. According to Edward Jung, Chrome UX engineer, 270 million games are played each month, across both desktop and mobile. Most players come from markets with expensive or unreliable data — like India, Brazil, Indonesia, and Mexico. 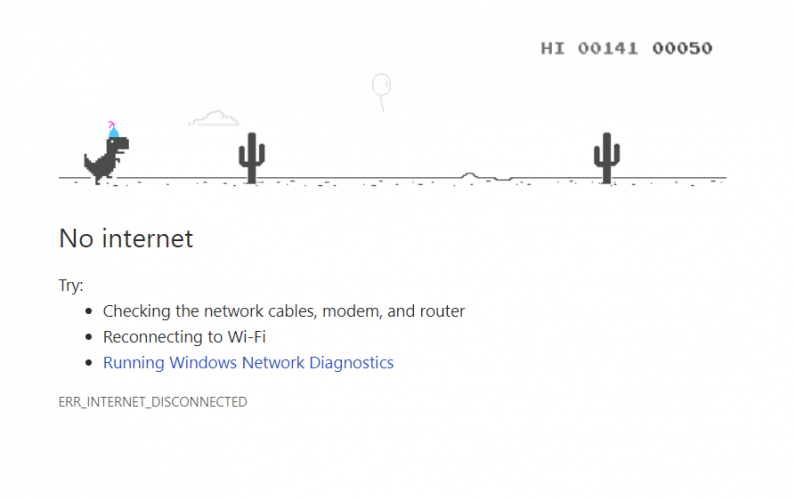 You can play the Chrome dino game without turning on Airplane Mode. Just open chrome://dino in your web browser, and you’ll be taken to an “arcade mode” where you can practice in a full-window environment. The current version of the game celebrates its 4th birthday, and is filled with colorful cakes, balloons, and party hats. You can forget about beating it, however, as the game concludes after 17 million years of playtime — roughly how long the T-rex was alive on earth.